How Far is TVH Titanium City Phase I? Titanium City Phase 1 is ready to occupy project by the top builders in Chennai, located in Mannivakkam. This project offers ready to occupy plots for sale in Mannivakkam, Chennai. The project is CMDA approved and is one of the best selling residential hubs in Chennai. Mannivakkam has seen a rise in the number of people settling down in the locale, this place is being chosen by the renowned builders to build residential and commercial complexes. This place is soon going to be a hotspot in Chennai. 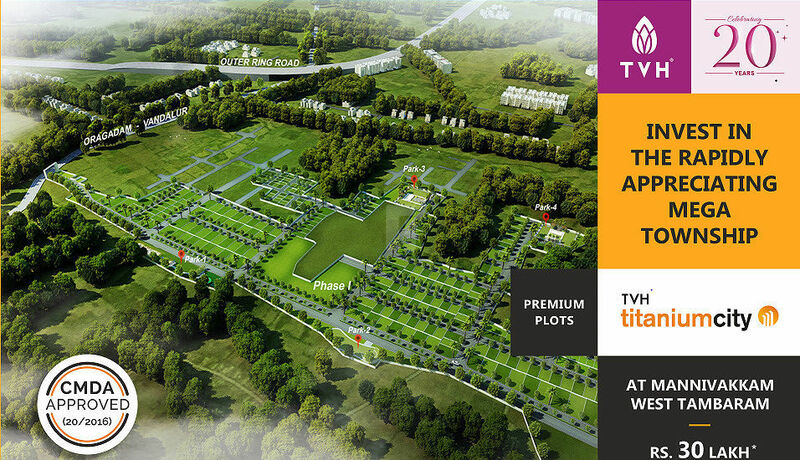 If you are looking for buying a plot that is in close proximity to many the city, and equally serves the benefit of elegance and modern lifestyle, you must look into TVH Titanium City Phase 1. Mannivakkam is thickly developed with the famed schools, hospitals, public parks and other civic utilities. This locale will give the benefit of easy access to many of the other recreational activities. The residential space of TVH Titanium City Phase 1 is all set to serve you the best living experience and offer you a wide range of amenities, for the convenience of the residents and offer you a very hassle-free life. The amenities offered are such as departmental store, park and children’s play area. Close Proximity Tambaram, Vandalur, Oragadam, Guduvancheri, etc. which are equidistant from GST.